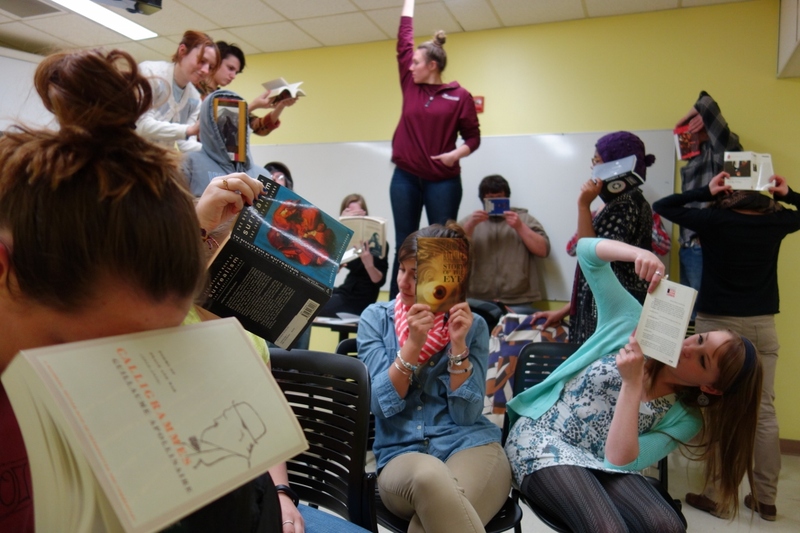 Students in ENG 370 (The Splendid Drunken Twenties) are participating this semester in a new experiment at UMF, as they are part of what is called a CoLab—a group of classes in different disciplines connected by a common interest or topic. ENG 370 is part of a CoLab called Modernisms and Manifestos, with the different classes exploring the modernist movements that began early in the twentieth-century and looking for connections across different disciplines: literature, music, art. Surrealism, a modernist movement that started in France in the 1920s and influenced art and culture throughout the twentieth-century, is one of the topics explored by all four classes involved in the CoLab. One activity that the CoLab sponsored was a visit from Bowdoin College Museum of Art Assistant Curator, Andrea Rosen, who offered a workshop on using surrealist techniques to create art and literature, and who also offered a lecture on surrealist photography. The Farmington Flyer recently published an article on Rosen’s workshop and on the Modernisms and Manifestos CoLab.